A set 20 orchestral instruments and their name labels, formatted in various ways to allow for a variety of options! 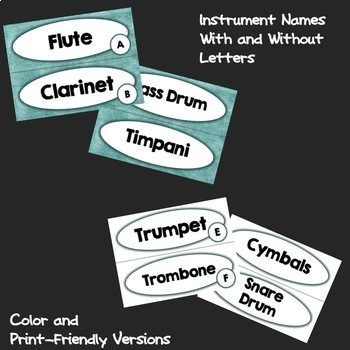 Instrument cards with labels may be displayed as a permanent part of your music room decor. 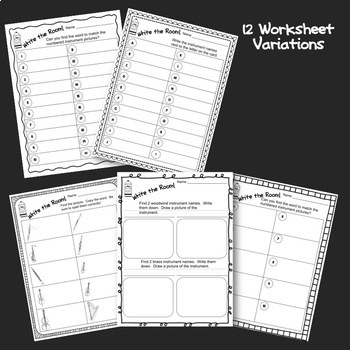 Use small cards in a center or large cards for display when every student has a clipboard and recording sheet. Some recording sheets are provided without directions to allow you to create your own variations of this activity. 1. Hang the label cards next to the corresponding picture. Write the words and practice reading them. 2. Hang the label cards only. Write the words and practice reading them. 3. Display the cards with pictures and labels. Students use worksheets with pictures only, find the matching picture and copy down the instrument name. 4. 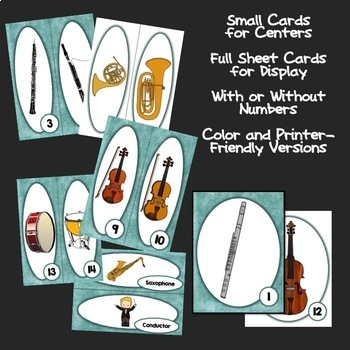 To focus on a small number of instruments, such as one family, display cards or labels without numbering. 1. Hang the numbered picture and label cards separately around the room. Students match the labels with the correct numbered picture. 2. Hang the label cards only. 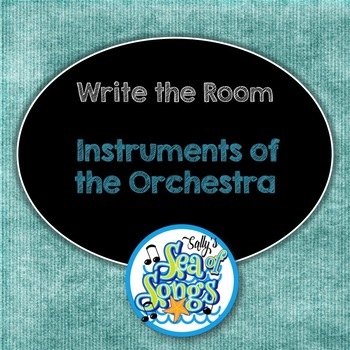 Students write the label in the box containing the corresponding instrument picture. 3. Display the cards with pictures and labels. Ask students to find an instrument from a specific family, such as woodwind, write the name and draw a picture of the instrument.